Today, day four, was scheduled to be a blog about the purpose of prayer. I wanted to talk about God's plan and desires for prayer. But that's going to have to wait. Instead today I just want to say something quick, but really important: let's be obedient with our prayers. I can count on one hand the amount of times that, as I've detailed a hard time or an illness, someone followed it with a prayer right in that moment. And I don't even need one hand to count the amount of times I've done this for someone else. Plenty of times we say "I will be praying for you", and I'm not doubting that we do pray for one another, but even though they are few and far between I can still remember the impact it made on me when someone took that very moment to lift me or my family up in prayer. It communicated God's love and conveyed His presence to me in a way that them praying for me on their own time, though appreciated, just doesn't. This is an issue of obedience and not just prayer. We are called to minister to one another, to share our lives and to pray for each other. It can be awkward and difficult in the beginning, it can feel scary and out of our comfort zone, but nothing conveys the love and the presence of our God more than inviting Him into a moment and praying His blessings over someone in the moment. My baby girl is about to turn one year old. She was born by scheduled c-section so we knew when we were going to be heading into the hospital. The night before two very wonderful friends of ours showed up at our house and asked to pray over me and the baby. They weren't there for any other reason. I can still remember how it felt to stand with them and listen as they prayed blessings and health over baby and me, I can still remember how clearly this act conveyed the heart of Christ to me and husband. And I still think about how impactful that moment was for me, the peace I went to bed with, the peace I woke up with, the peace that stayed with me all day. All because two people were obedient with their prayers. 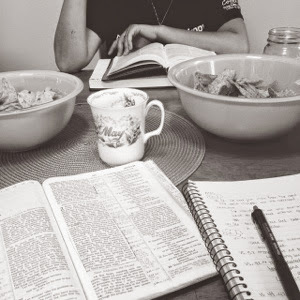 Last night After our home group I was sitting and talking with that same friend and I felt the conviction of that moment almost a year ago, and, led by her example, asked to pray over her and some things happening in her life. I have no idea how impactful that prayer was for her, but I know that stepping out of my comfort zone and being obedient to the Holy Spirit made it hugely impactful for me. Let's be that kind of Christian, let's be obedient to the Spirit, ministering to one another, let's be obedient with our prayers.